Compatability: Windows 95, 98, NT 4.0, Windows 2000 and XP with at least 64 megs of RAM. When you first run the application you are going to want to click "Background" and read up. Here it explains why you are shooting the asteroids in the first place, the game commands, the weapons you can acquire, and more. Once you get bored of that, there is the game itself. 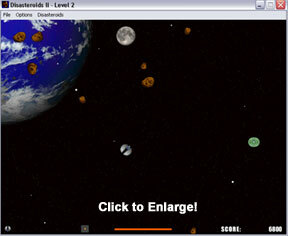 The object of the game is to shoot all the asteroids, alien ships, etc. and advance to the next level. You are able to shoot with your shift button, accelerate with your up button, turn with your right and left buttons, and activate your shield with your down button. What makes this game very challenging is the controls. There is no instant break, and you only have a "thruster" in the back of your ship. This makes the game challenging, because if you want to stop, you have to turn around and use the "thruster" to stop. Additionally, since there is no real break, you will just keep going and going and going, causing you to think fast and strategize. In general, they are great! 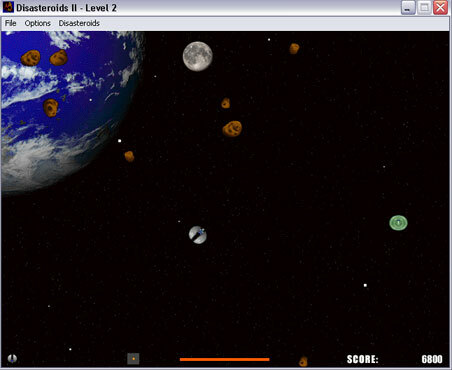 The asteroids, ships, explosions, and other elements of the game exceeded the expectations of a free game. The only bad thing is that you have the same background throughout the whole game. First of all, the sound effects are great. The explosions, and shooting sounds seem semi realistic, and there are no sounds that make you feel like you are listening to something at the lowest quality possible. As for the music, it is great also. However, music is not played during game play, but only during the start of the game, and on the records page.